Spider Snack Week continues on Kids Commute from Interlochen Public Radio! It’s been a fun week as we shrink down to bug size and witness the adventures of a spider trying to snag a tasty snack. This week we listen to “The Spider’s Feast” - a ballet by French composer Albert Roussel. Our story so far has taken us from the spider building its web, a poor butterfly getting stuck, and a battle between our spider and some mantises fighting over fruit worms. Today, we’ll listen to music for mayflies. 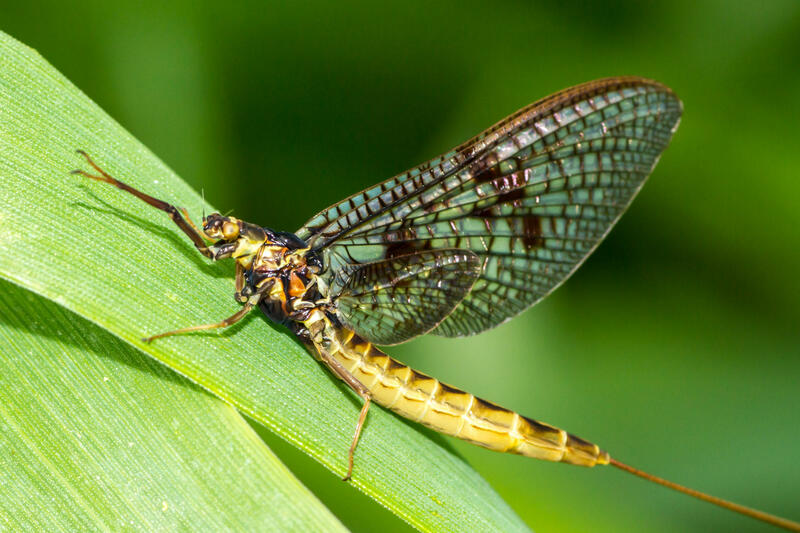 Mayflies have an incredibly short life - usually a day or less! Today’s music is the soundtrack to a mayfly hatching and having a little dance before meeting its fate. KC 273 - Spider Snack Week! Thursday: Today, in Albert Roussel's ballet "The Spider's Feast," we'll hear beautiful music for the short life - and death - of a mayfly. So far, we’ve heard music to accompany the spider building its web and catching its first meal. In today’s show, we shrink ourselves down to bug size to observe some major bug drama. An apple has crashed to the ground, bringing fruit worms with it. Those fruit worms sure look tasty to the spider, but they also look tasty to the spider’s rival - praying mantises who think those fruit worms look really tasty too! How would you feel if somebody tried to steal your lunch? You’d probably be pretty upset, and so is our spider who fights for its right to a decent lunch. The ants from Monday’s show circle around the mantises and the spider and cheer on the action! KC 272 - Spider Snack Week! 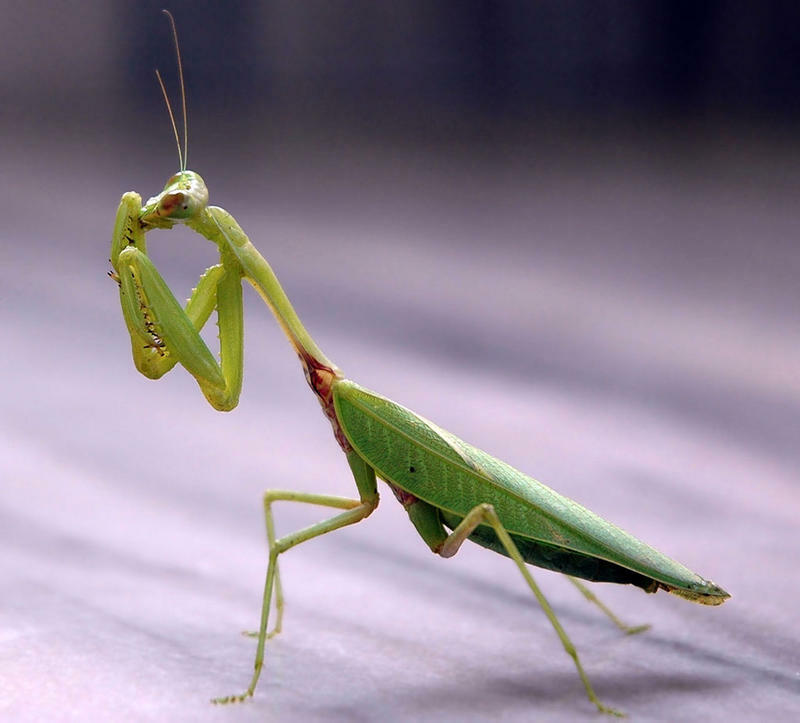 Wednesday: Today, major bug drama in Albert Roussel's ballet "The Spider's Feast" as a couple of praying mantises fight over the morsels in the web! Welcome back to Kids Commute from Interlochen Public Radio! This week, we’re listening to highlights from Albert Roussel’s ballet, “The Spider’s Feast”, written in 1912. 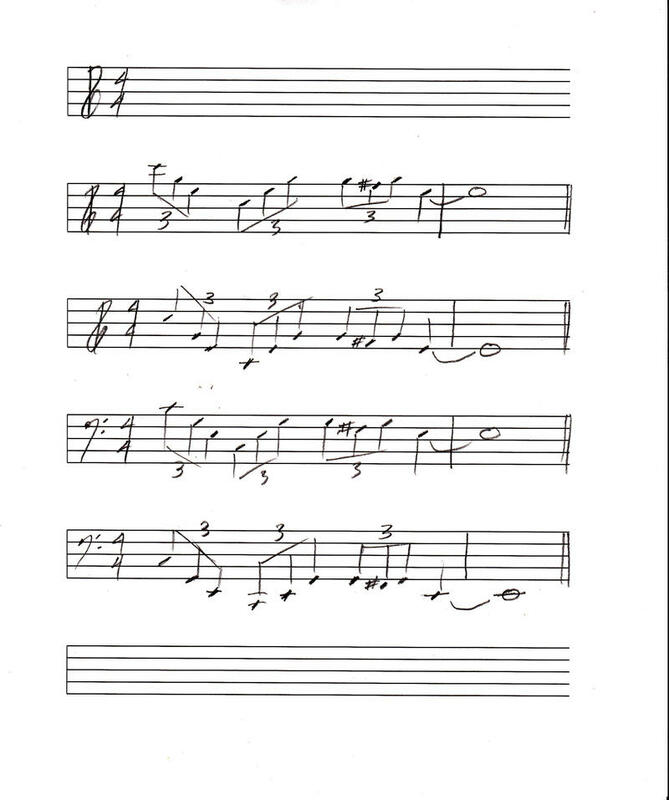 Listen to the story develop and after the music, you’ll get a hint at the answer to this week’s Quizlet. In yesterday’s show, we heard the music that accompanies our garden spider as it builds its web to catch a tasty meal. Today’s show is bad news for butterflies, or rather, one butterfly in particular. Our spider’s web has worked! Listen to the music of a butterfly gracefully flying, then struggling as it realizes it’s stuck in the web. KC 271 - Spider Snack Week! Tuesday: "The Spider's Feast" Part Two. 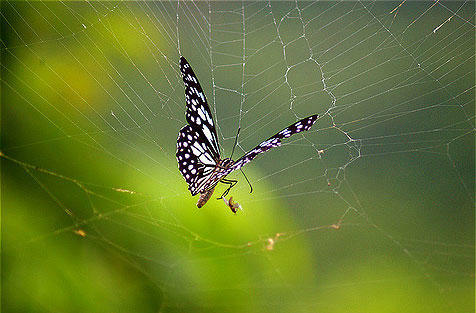 Today, a butterfly gets caught in the web!